Day three is what it is all about. The start of the trek proper! I wake at 4.45am in the hotel in Kathmandu and jump straight into a freezing cold shower and therefore straight out again. It may be my last shower for 18 days, and so it is very necessary and welcome nonetheless! Everyone is in breakfast shortly after 5, and before we know it our bags are loaded onto the bus and we are off to the airport. The skies are clear, which is great, as if they are not, or it is windy, then the plane will simply not take off. This is a journey on a twelve seater plane, pictured below, to the world’s shortest runway, at just 250 metres. It is also christened ‘the world’s scariest airport’ as the pilots fly directly at the side of a mountain, to a runway banked at 15 degrees. They have to land the plane in exactly the right spot, and get one chance at it. If they miss, it is curtains, simple as that. 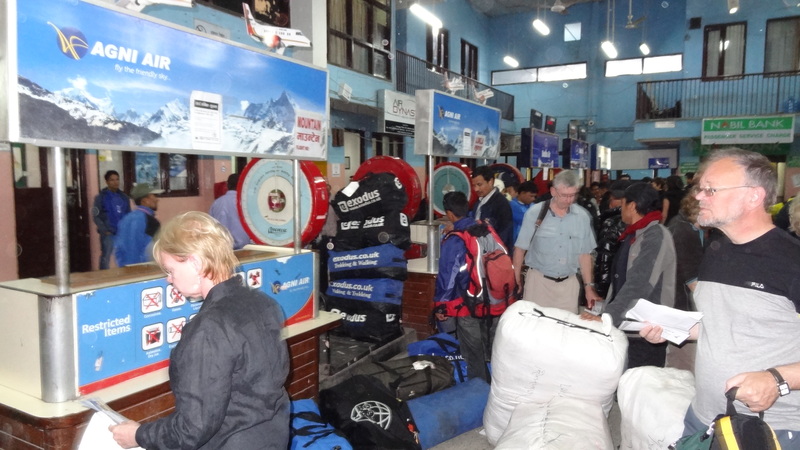 Our bags get loaded and weighed for the flight to Lukla - 12kg seems to have gone out of the window. 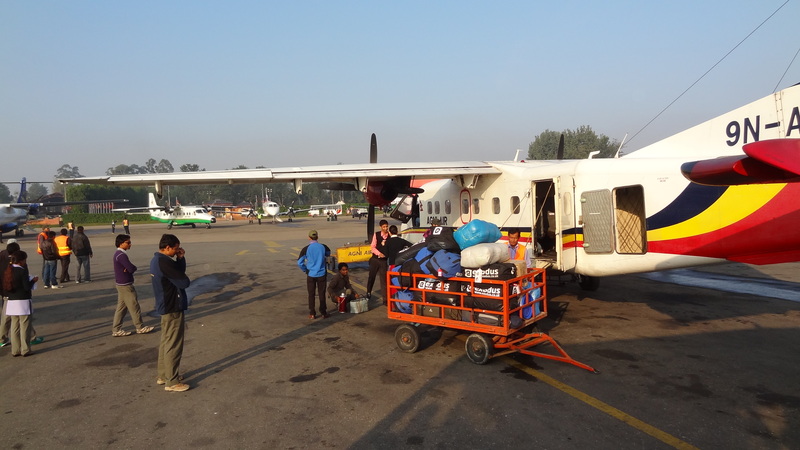 And our plane, A Dornier, to fly us into the Himlayas is duly loaded. If I said I was nervous before and during this flight, it would dramatically understate the facts. Despite this, the flight was breathtaking, pure and simple. We are greeted with almost instant views of the snow-capped Himalaya, the sun glistening beautifully from the ice bound caps of every one, their names unknown to me, but their majesty unparalleled on planet earth. We are too far away still to see as far as the 8,000m peaks yet, but there will be plenty of time to see those, including the greatest of them all, over the coming days. I don’t think I knew just how vast and amazing the Himalayas would look upon first viewing, but I was just staggered. It is one of those moments that just make you smile and be aghast at the same time. These are the moments that I am here for, and I am so overwhelming stunned by the views that I cannot wait to get closer to the mountains themselves, and I can scarcely believe at I will start walking into them literally in a matter of an hour or so’s time. 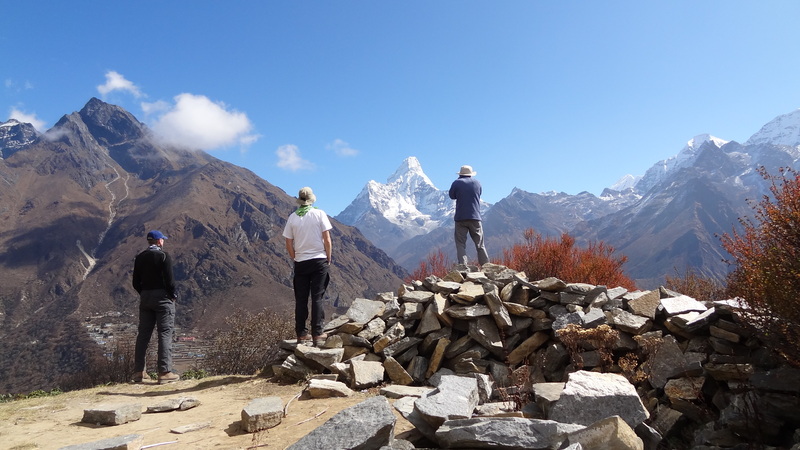 The snow-capped Himalayas come into view for the first time. The flight takes just 30 minutes, and then the runway is fast approaching us. It looks like we are heading face first into it, so steep is the descent and so banked the runway itself towards us. 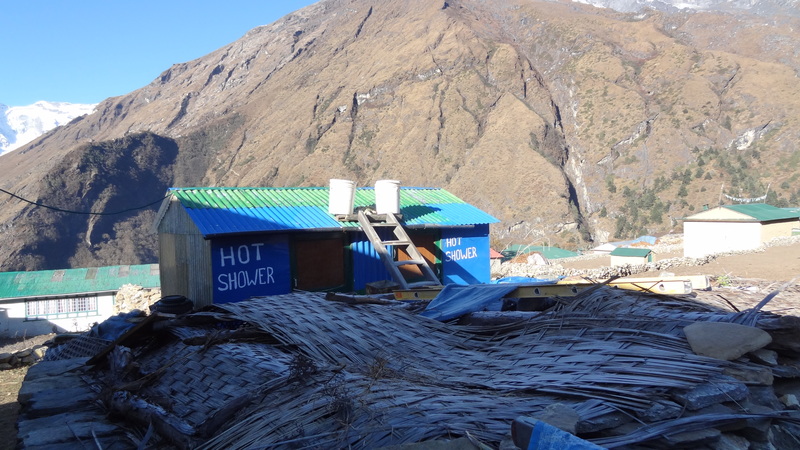 Almost before we know it, or have too much time to think about it, we are somehow on the ground, and braking hard uphill to quickly bank right to the front of Lukla airport, which is no more than a stone hut. 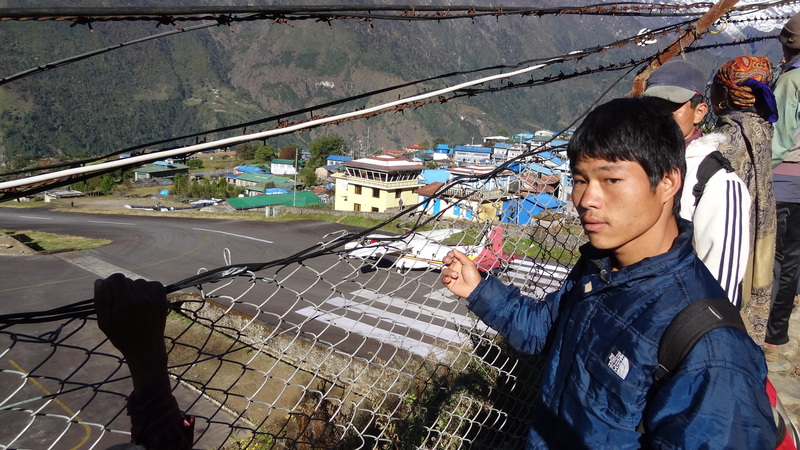 Around the runway are seemingly hundreds of Sherpas, all looking for work from each successive arrival of tourists. In peak season, which we are in, up to 100 flights a day will touch down here. 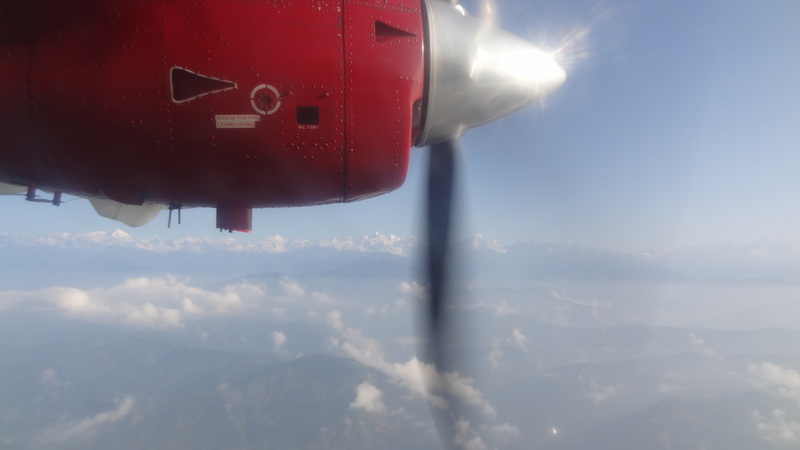 On the ground in Lukla - and yes the runway really does slope a long way! 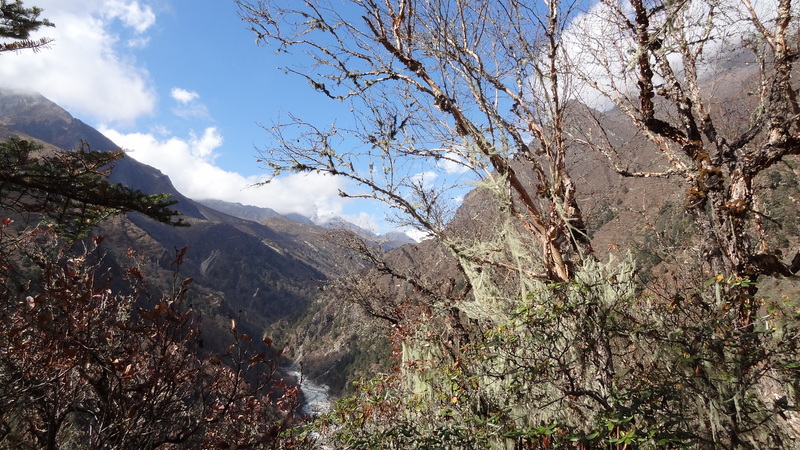 The first day’s walk is actually a net descent of 200m, to a place called Phakding. 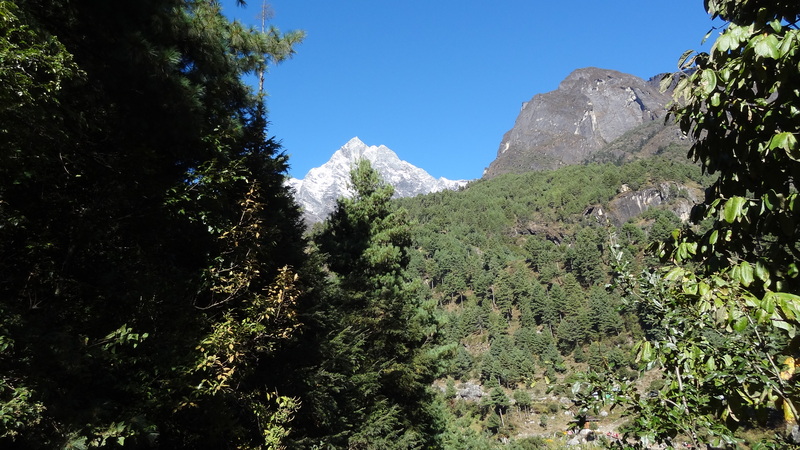 We have flown up to 2,800m, and to start going up further would be to risk feeling the effects of a too sudden ascent, so the trail (for all Trekkers heading to Everest in fact) takes them down this path on day one. It is a short walk, punctuated most memorably by several suspension bridges. Within minutes of being on the trail, the emotions of what I am doing, where I am, quite hit me. 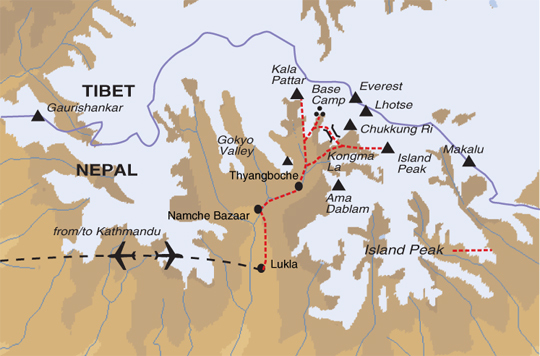 It is now very very real, I am here at last, on the trail, and as early as tomorrow I should get my first glimpse of Chomolungma. The track is incredibly well laid, of mostly stone path and dirt trail. 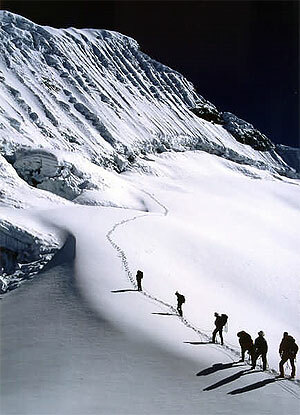 All the way we are passed in both directions by the incredible Sherpas. They can carry considerably more than their body weight, sometimes up to about 120kg, or 290lbs, strapped to their head! You cannot believe some of the loads these guys carry. We are also passed in the opposite direction by seemingly endless djo trains and also mule trains. 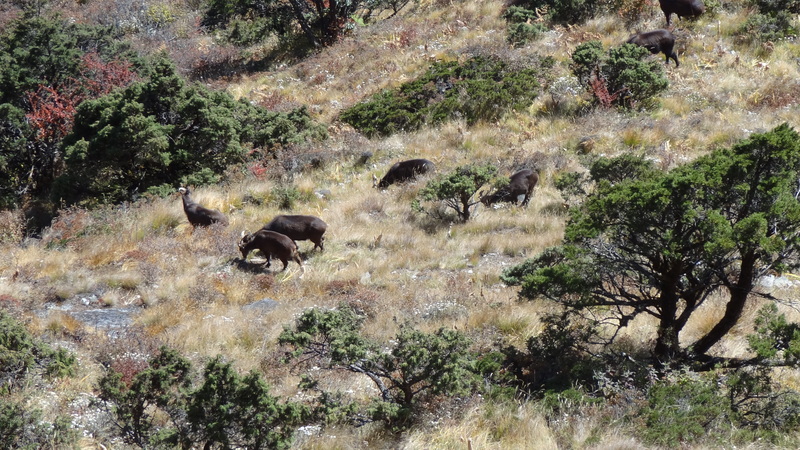 The djo is a cross between a yak and cow. Higher up we will see yaks, but they cannot survive down at this altitude, so their shorter haired relatives are deployed here instead. 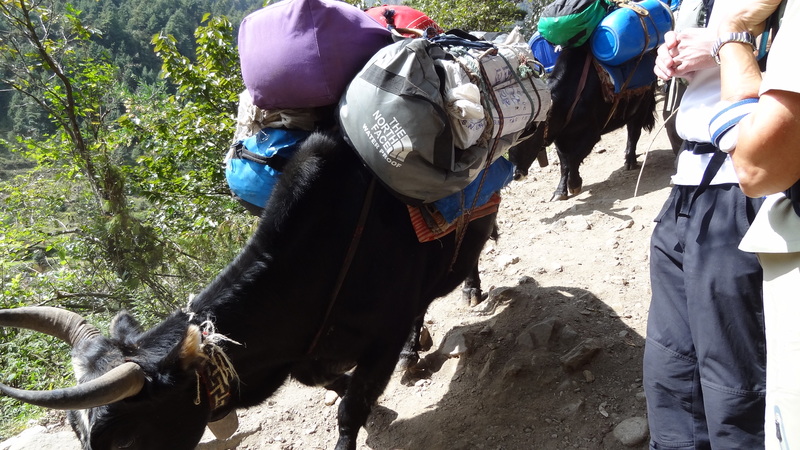 We learn that you must always let the djos and yaks pass you on the ‘down’ side of the mountain path, as they never stop, and you really done’t want to shoved off the mountain by one of them. 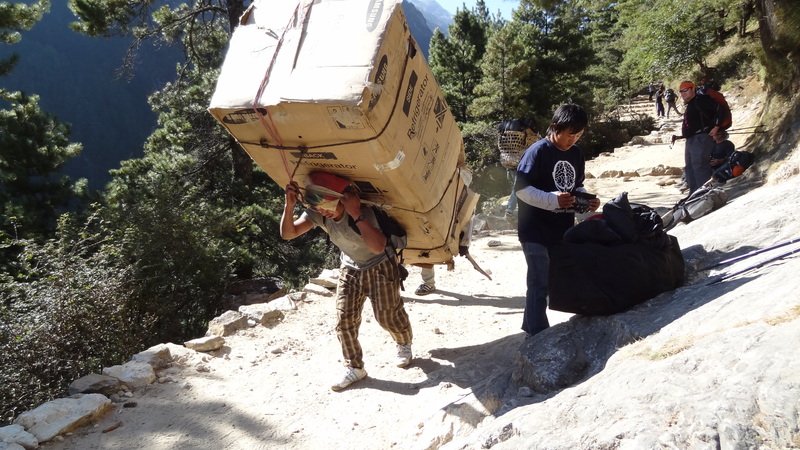 The djos carry the bulk of our luggage up the mountain. 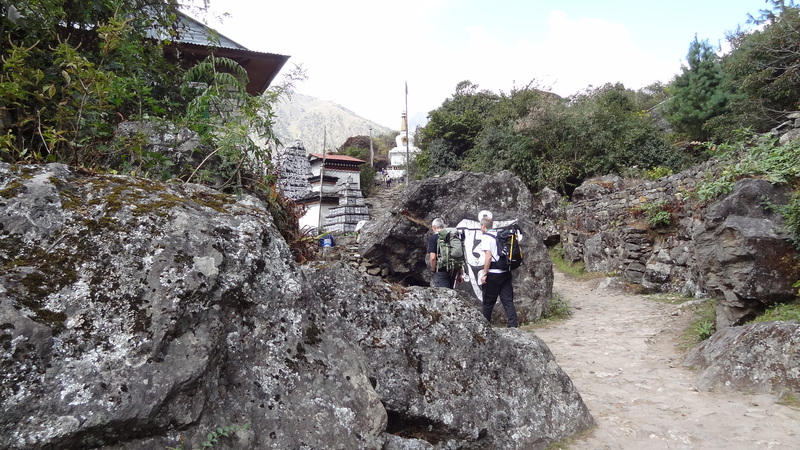 The walk also sees us pass our first prayer flags, prayer wheels, and mani stones. The mani stones are basically prayer messages in the Tibetan/Buddhist faith, and take the form of often very intricately carved tablets, or are sometimes just carved onto bigger rocks. You must pass any of these to the left for good luck, as this is the direction of the earth’s rotation. You can also enhance your blessings and good karma, and keep away from negative influences by spinning the prayer wheels (three times is recommended). 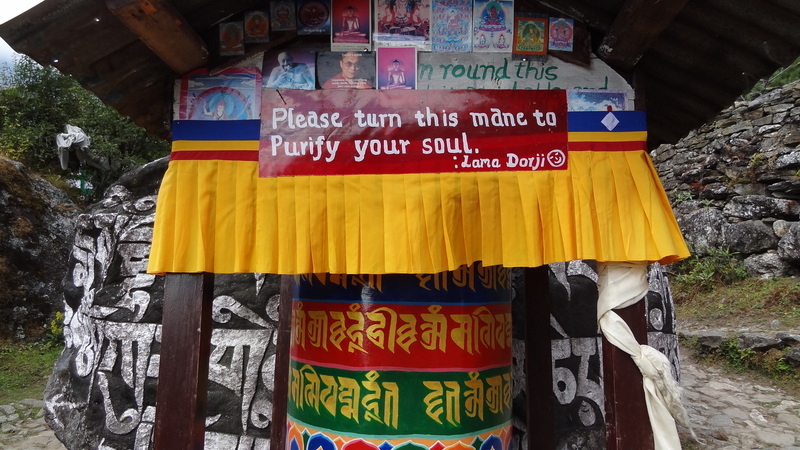 A prayer wheel, with various blessings attached. The views all around are amazing. Towering peaks loom in the distance, although as yet only those to about 6,000m, as the valley that we are in, that of the Dudh Khosi, or milk river, obscures those further up and further away. We are probably within about 30 miles or so of Mount Everest at this point in time, our overall walk there and back being bout 70 miles or so. Mountains only giving glimpses of themselves at this stage of the walk. The weather is beautifully warm and sunny, and I walk with my lower pants zipped off, and just a T shirt, although when the sun hides behind the valley walls it feels a bit cooler. Everything is also very lush, the summer monsoon having only finished a few weeks ago. 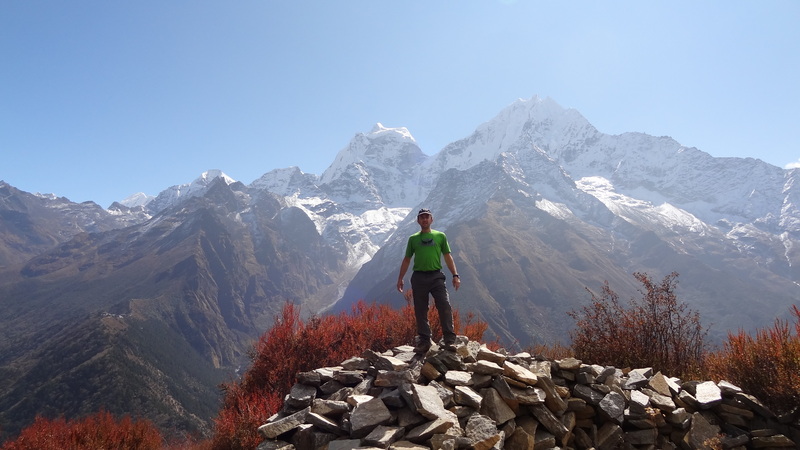 Other than the glimpses of faraway snowy peaks, sherpas and the yak trains, we could be hiking almost anywhere. There is green grass, lush vegetation and abundant flowers and trees. 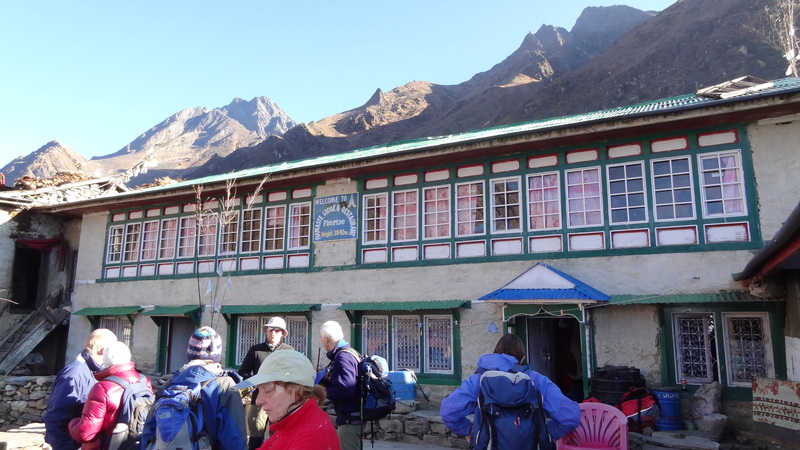 The walk takes just around four hours, including a lunch stop, and we are here at Phakding in the early afternoon. 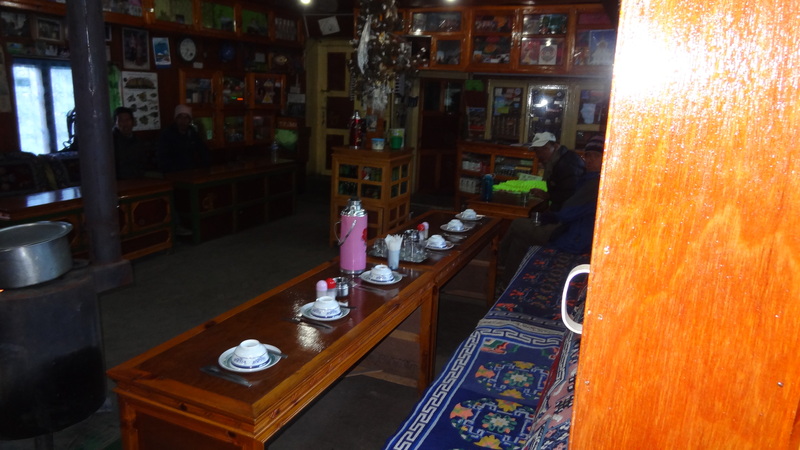 We are to stay at the Tashi Tagey Tea Lodge. I am very pleasantly surprised when entering the lodge – the bedrooms are nice and spacious and clean, the eating area quite cozy and homely. It is far nicer than I had imagined. 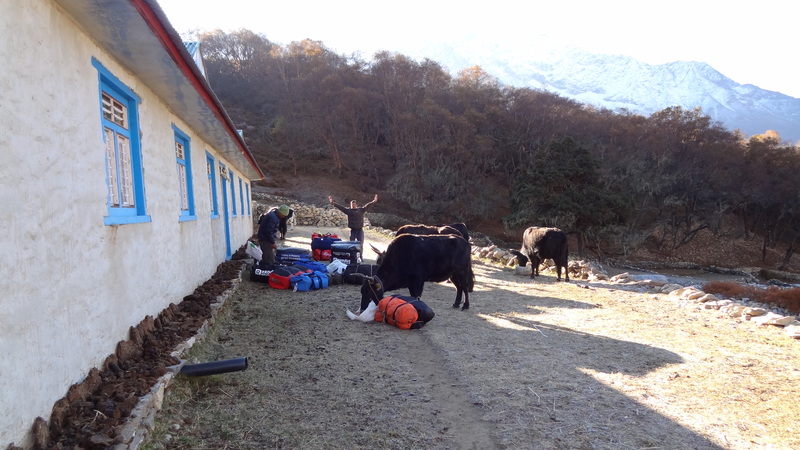 I was expecting a stone hut with a cold stone dormitory, and a yak dung stove. Maybe even donkeys or a manger or something too. Perhaps we will see that sort of thing higher up the mountain. 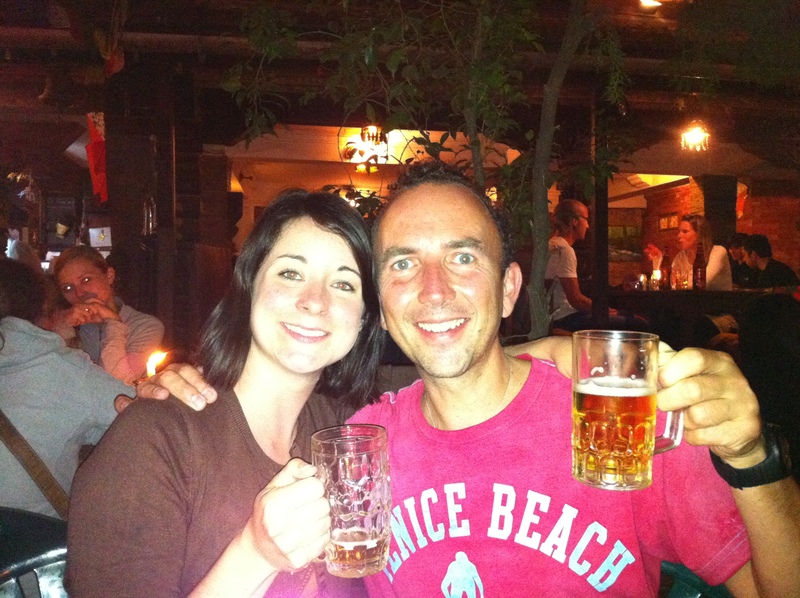 After a nice relaxing afternoon we have dinner from a menu that we can choose from, and it is great and plentiful. I drink ginger tea, and look wistfully at the bottles of beer on display at albeit stupidly high prices. I would love one, but decide better of it. 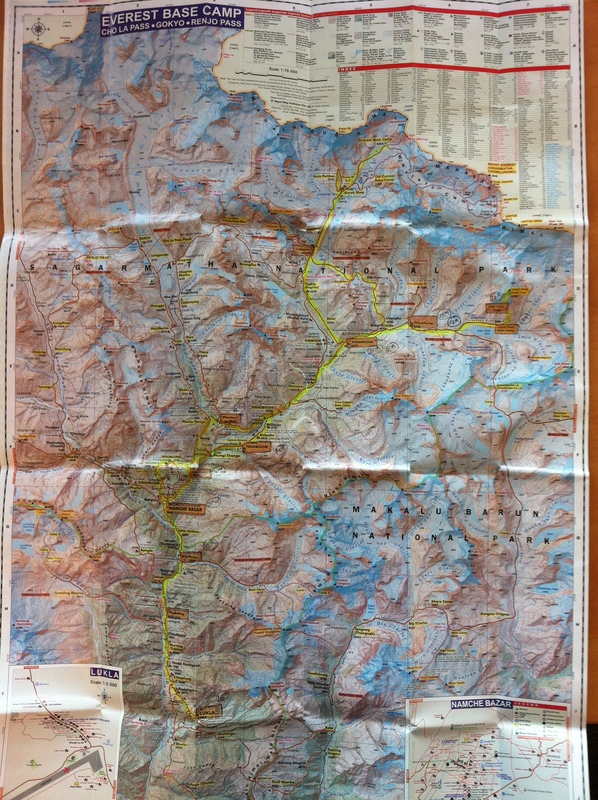 By tomorrow we will be at 3,500m, and the onset of potential altitude headaches or worse will me upon us. 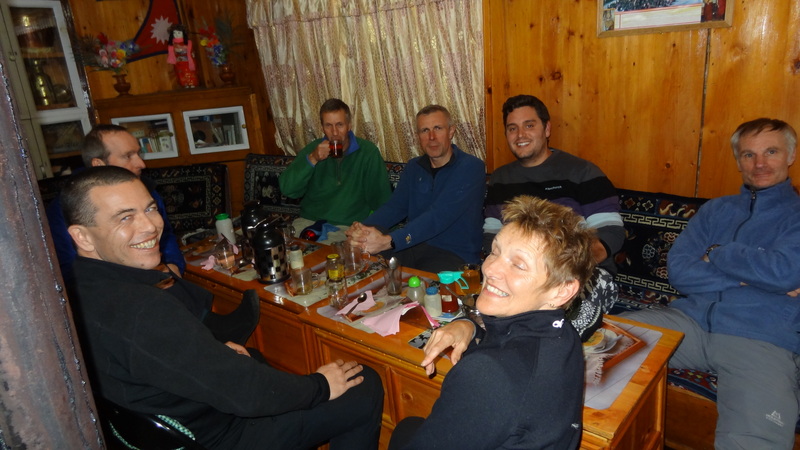 We will need to drink around four litres of water a day to hopefully stave off the effects of AMS, and to drink alcohol at this altitude is foolish at best. I am now therefore on the wagon for the next 18 days, which can’t hurt me after all, even if it doesn’t sit well with me at the moment. After dinner of our choosing (I got spaghetti with tomato sauce and it was delicious) we get our briefing for the following day. 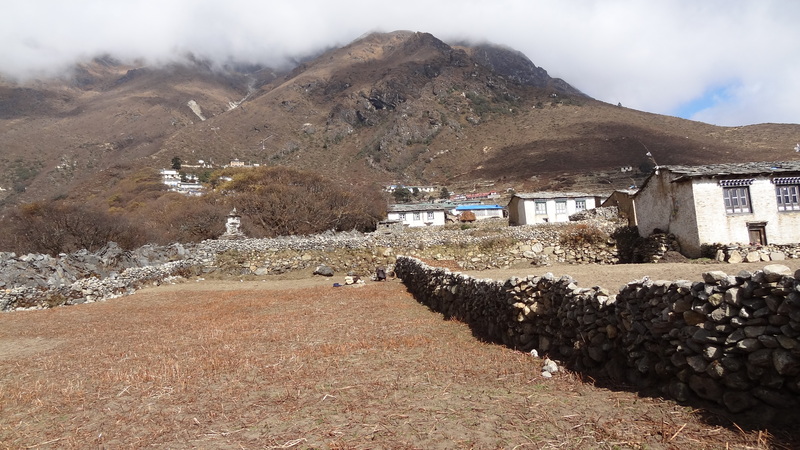 We will be walking for around 6 and a half hours from here to Namche Bazaar. That very name has excited me ever since I first heard about it on the trip notes. 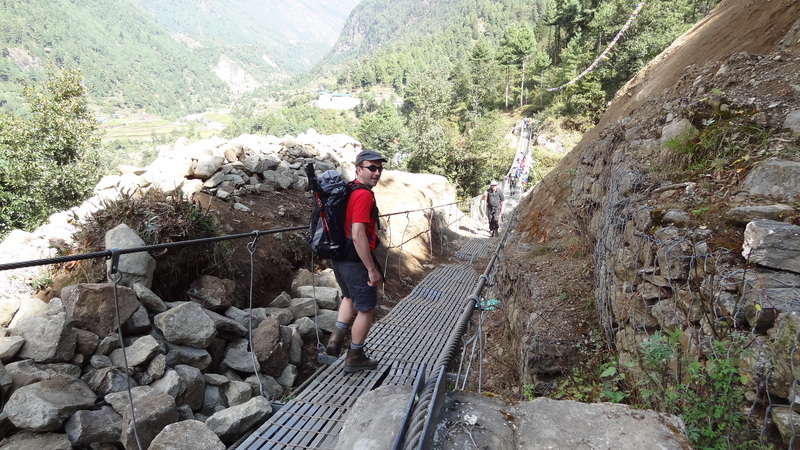 We will tomorrow alone apparently cross 5 suspension bridges, the last two of which are very high, and then there is a very steep path, where at some point we should catch our first, but fleeting view of the thing I came here for – Everest! We all troop off to bed around nine and will have an early start at around 6.30. 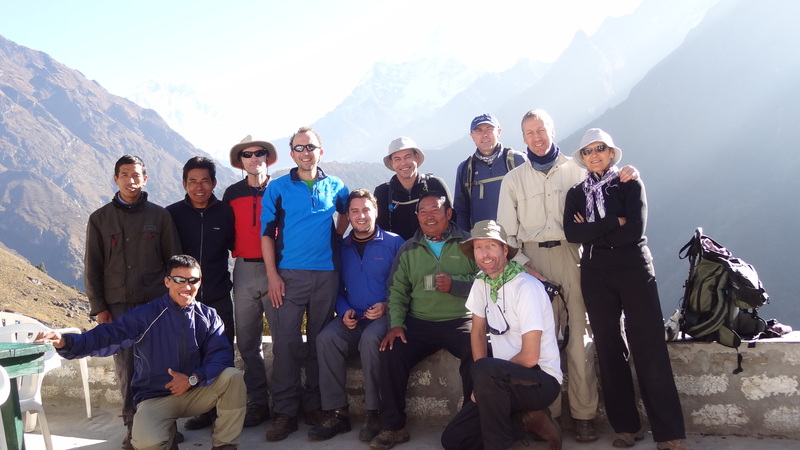 The trek is on, and we have completed our first day in the foothills of the Himalayas. I am so excited about everything that I will see higher up, and this day is a great (and also nice and easy) taster for it all, and yet I have already seen and learned so much. I hope I can sleep……. So day one trip to India and then Nepal is fairly uneventful to start with except for a bit of a momentary panic at Heathrow. 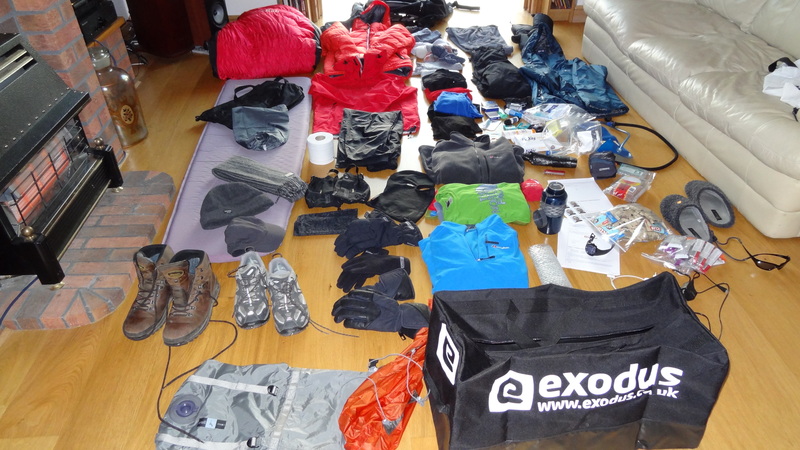 Having packed and unpacked (and weighed and re-weighed) my main holdall fairly religiously I knew that I was at around 22kg. 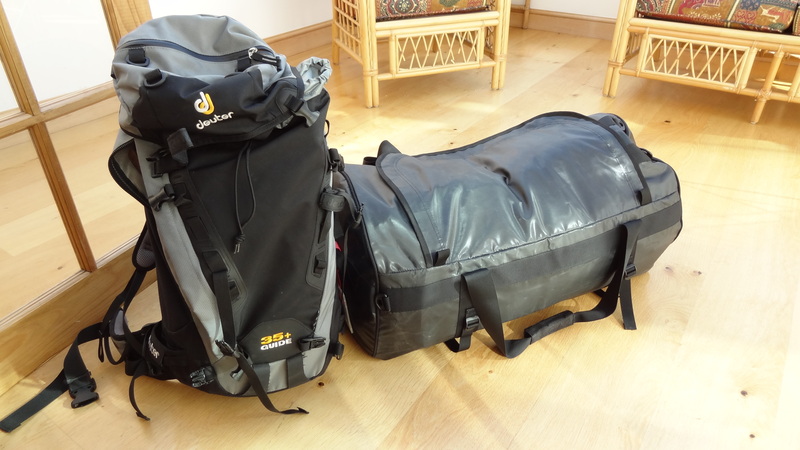 I also knew that my weight allowance was 20kg, but I have my rucksack with me as my carry on, and so I am braced to have to take a few things out at check in if I get a strict check in clerk. As my bag goes onto the scales however it is 24.4kg! Whoops – that must have been the extra few pairs of underwear and T-shirts I threw in at the last moment 🙂 Anyway I needn’t have worried, and it doesn’t even trigger the slightest flicker. Most people around me travelling to India seem to have three or four suitcases each. I don’t see too many rucksacks or walking boots in evidence, so there aren’t a whole load of people going my way it seems. So my first time on what is almost Indian soil, except it isn’t, as I will not be leaving the airport, is a shock, in actually a great way. I had expected Delhi to be all, you know, third world. My only real thing to base that on was flying to places like Sri Lanka and The Maldives. Neither of those places would you wish to spend any longer than the bare minimum in the airport. Then there is Africa – when I went to Kililmanjaro it was definitely a case of ‘welcome to Africa’ when I first got to Nairobi Airport. The place is filthy and horrible at best. 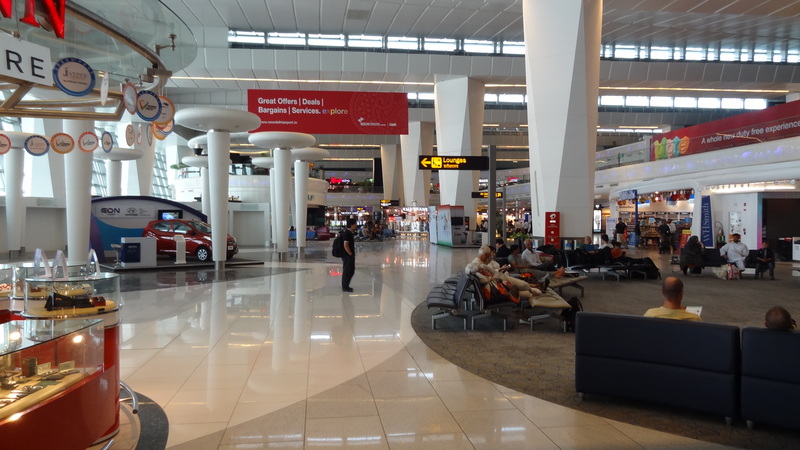 Delhi airport however was actually pristine. Inside Delhi Airport - what a pleasant surprise it was. My flight on Jet Airways from Heathrow was actually great – I had not heard good reviews on them, but the service was friendly, the plane was clean and modern, my food was very nice, and they didn’t charge me for three gin and tonics and a couple of glasses of wine, so they get top marks from me. When you do land in Delhi, the very first thing you notice is the smog. I have no idea how many quadrillions of people live in Delhi, but you cannot even see from the airport terminal to the runway. It is also hot, unsurprisingly, but the airport is very nicely airconditioned. I arrive and find my way through the International Transfer lounge, and expect a tin hut. I couldn’t have been more wrong. I find the plushest terminal I have almost ever seen. I find shops by Boss, Gucci and Tiffany. I see the most beautiful and clean architecture. The floor is polished so beautifully you could eat your dinner off it. There are almost no indications that you are not in say Copenhagen. I do see a few signs, like the odd presence of a ‘Self Medication’ room. I decide to pass that one by, and instead hook up to free Internet access and plentiful (British three pin!) plug sockets to charge my various Apple devices. 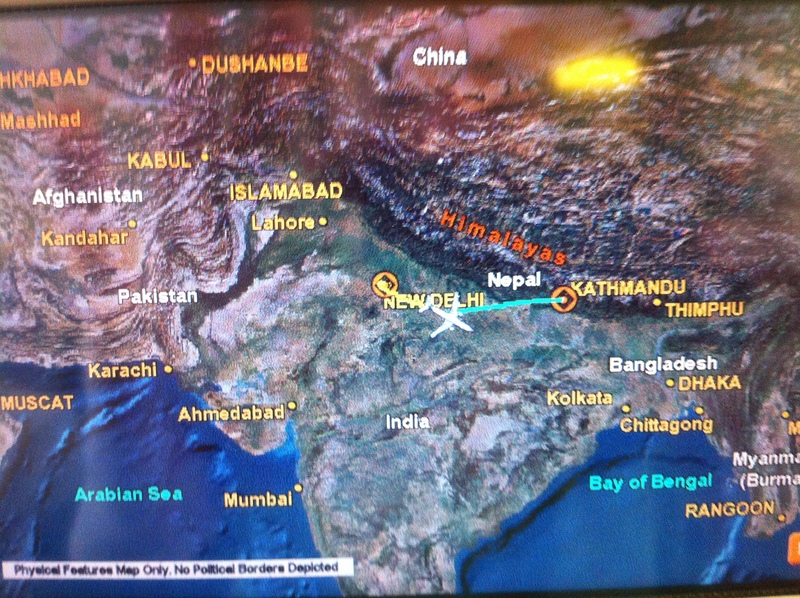 I then board another Jet Airways flight, this time to Nepal. The flight is reasonably short and uneventful, other than sitting next to a guy from Wisconsin with a very dubious looking haircut, and a diplomatic passport, whom I decide is some sort of air Marshall type, unlikely as that sounds over in these parts! Landing in Tribhuvan International Airport in Kathmandu, I am met by Ngima, who is to be our guide for the whole trek. He is Nepalese, and a really nice guy. I also immediately meet six of the other seven people in the group. They are Stefan from Manchester, Tony from Hull, Ben and Bruce from Norwich, and Dave and Mo from Hampshire somewhere. All seem great. The remaining guest is on a different flight and will arrive later – he is Rob from Surrey, and he is to be my roommate/tentmate for the entire trip. Most people apparently have oodles more mountaineering experience than me with the exception of Ben, who like me has only done Kilimanjaro before. 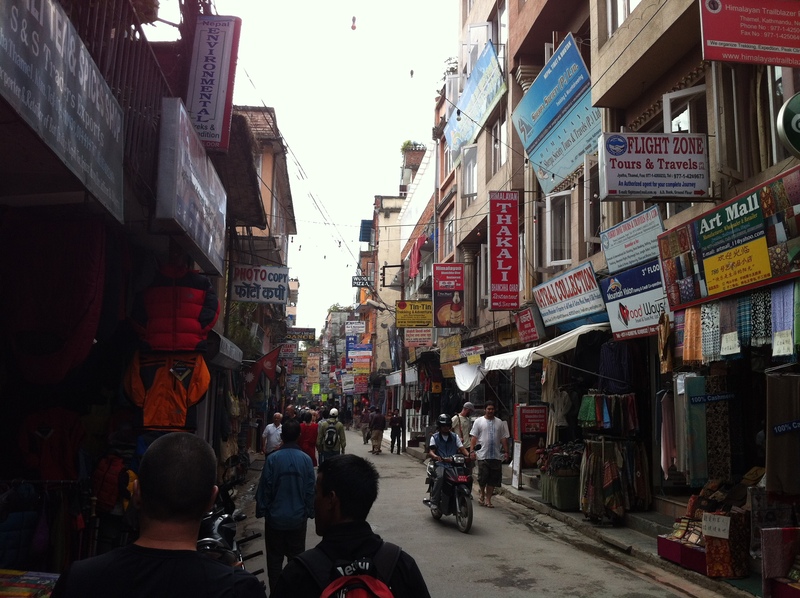 Journeying through the streets of Khatmandu to our hotel, the Royal Singi, is a real eye opener. It is almost like being back in Arusha, Africa, all over again. The place is filthy, with ridiculous traffic congestion and air pollution, a thousand horns blaring a once, and the streets lined variously with beggars, street sellers, cattle and dogs. Every vehicle stops for nothing, it is a complete free for all at all times. The Royal Singi Hotel is not bad at all, and better than I was expecting. 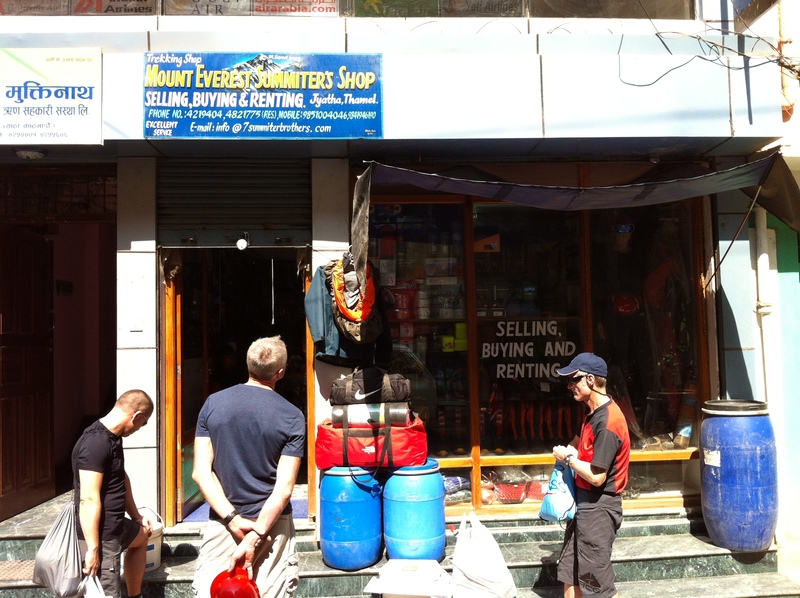 We have a quick briefing with Ngima, and then after surrendering passports and filling in various forms, he tells us he will take us out for dinner into Thamel, the busiest part of town. We head to a place called Kilroys, a restaurant run by a British guy and the food is a very eclectic mix of British and Nepali. They have Dhal Bhat on the menu, and whilst I feel like I should be eating something local, I’m told that I may well be eating that every day on the mountain, so I opt for a Balti Chicken instead, which is great, if really spicy. 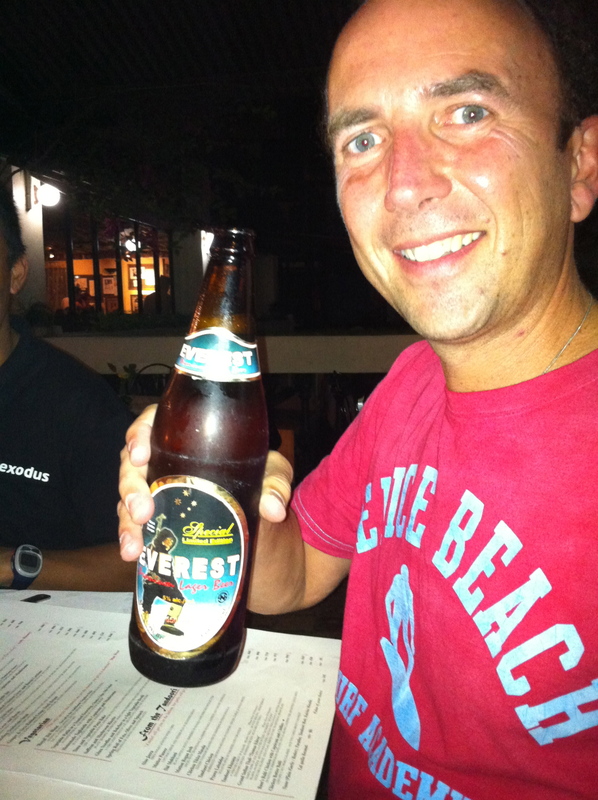 It is washed down by my first Everest Beer, which is just what the doctor ordered. An early night ensues, as having spent the previous night flying to India, no-one has been to bed for effectively two days. 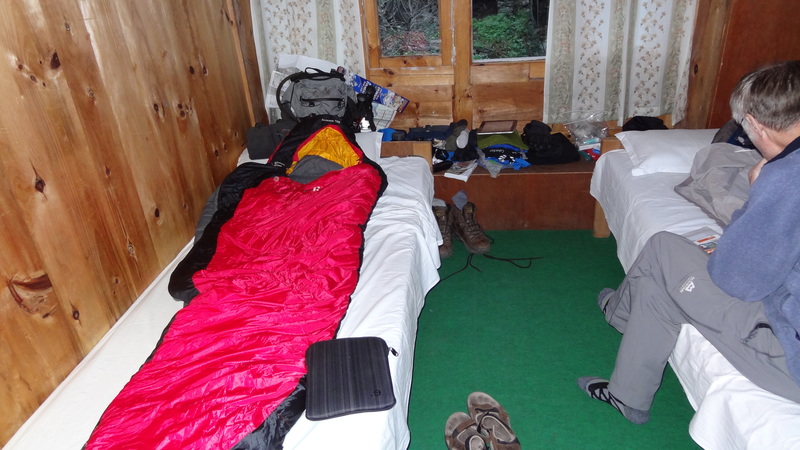 Sleep therefore comes ridiculously easily, and I look forward to seeing some of Kathmandu the following day. It is great to be here, although I am feeling a bit uneasy about the trip itself, as all of a sudden I am here, and it cannot get more real than this, and yet it is all so different and unknown all of a sudden. Tomorrow morning we will also get kitted out with our climbing equipment, and that is certainly something to sharpen the focus entirely.